Whether you'd much prefer to hibernate during the winter months or genuinely enjoy pounding the snowy pavement, here's the universal truth: When working out during the colder months, properly bundling up is a must if you want to avoid injury. It's called "warming up" for a reason; wearing layers during a freezing jog is as crucial to preventing muscle strain as stretching beforehand. Fortunately, one of our favorite rising activewear trends is as cozy as it is stylish. This season, we're seeing fleece-adorned everything, from pullovers to oversize jackets to sandals. Consider this your invitation to hygge-ify your wardrobe—and make your winter workouts all the more enjoyable in the process. Shop our favorite fleece pieces below. A word to the wise: Choose a fleece jacket that's warm enough for wintry hikes but cute enough for a night out. Is there anything better than slipping your freezing legs into fleece-lined sweats? Bonus: The high waist on this Champion pair is incredibly flattering. While we wouldn't exactly advise wearing these outside in subzero temps, they're a great option for lounging around the house or stepping from the yoga studio to your car. 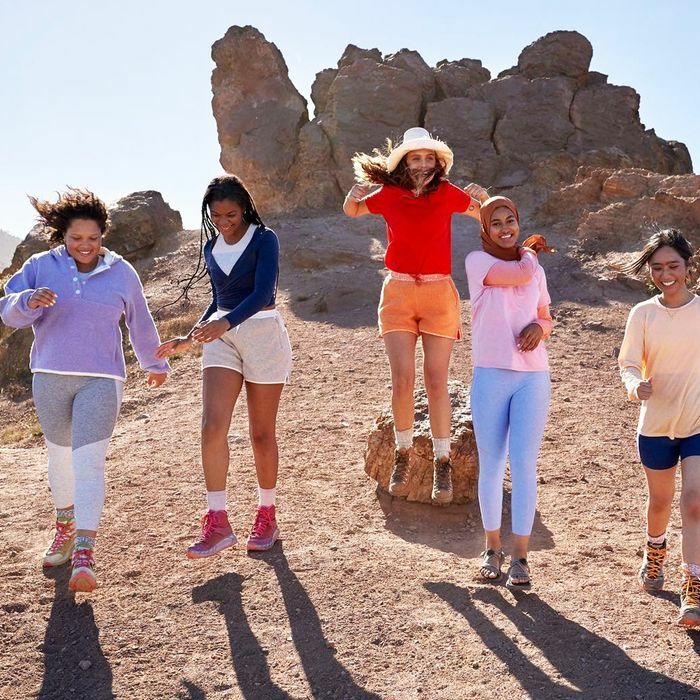 Outdoor Voices' new MegaFleece collection is so in-demand, the brand is having trouble keeping it in stock. Scoop up this ultra-cozy pullover before it sells out again. Keep your ears toasty and your hair on lockdown with this super-soft headband. From sleet to rain to snow, this fleece-lined parka can handle it all. The most brilliant part of these shorts isn't the furry texture; it's the loop in the back waistband to store your other layers. Next up: Nine things to do now to keep your immunity boosted all winter long.